Until recently, we had 3 development teams working on the MOT service, but we’re just moving to 4. This is so we can start implementing the new roadworthiness directive, as well as keeping going with more general improvements. Getting the new team on board has been good fun in rapidly getting them up to speed with MOT. Part of our way of working is making sure that the whole team understand the business context - so we’ve taken them to see how garages work and how IT we develop is used. One of the biggest things the team have been working, is getting this service fully ready for the GOV.UK website. As with all government services it needed to meet the government’s ‘Digital Service Standard’. This means it looks consistent with other government services and is designed to meet the user's needs. The team had the assessment for this service at the end of September, and recently had the news that the service has passed. 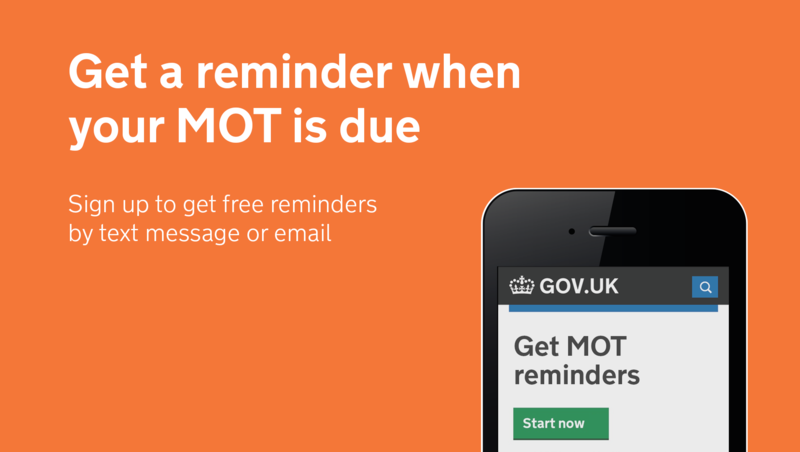 This will mean customers will soon be able to find the service if they search for ‘Get MOT reminders’ on GOV.UK or any other internet browser. Being able to find the service on GOV.UK will make it easier for customers to find, and reassure customers it’s an official service. As you might already be aware, we’re changing the way you get in contact with us, as our work is being centralised into one office. We know some of you have found it hard to get in touch with us sometimes, so moving to a central team means we can have a larger team in one place. It also means we can be more consistent in how we deal with things. So from 1 November, any queries that would have gone to your local office, will be dealt with by contacting our customer support team - on 0300 123 9000 or by email at motadministration@dvsa.gov.uk. This will affect changes to authorisations, new authorisations and all other queries that would have been dealt with by area offices. However, if you do have a question about the IT system such as the MOT testing service being unavailable, you’ll still need to contact the Business Service Desk as normal on 0330 123 5654. As part of work into improving our administrative processes, we’ve been looking at the volume of ‘replacement’ certificates we’re issuing. One of the main reasons we need to issue these is because mileages have been entered incorrectly, and the volume of these is rising. 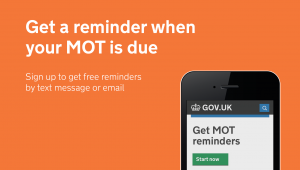 Part of the reason that volumes being requested keep going up will be because drivers are more aware of the mileages now they are made public through the MOT history service, but we do need to make sure we are minimising errors. With more motorists aware of these mistakes it’d be great if we could improve accuracy of input. We’re also looking at whether we should extend the time a garage has to make corrections of such errors from the current 7 days. I’d like your feedback on this, so let me know what you think by commenting below. We’re also just starting to do some experimental work in one of the areas we can move the MOT test forward. It’s still early days but we’re looking again at how we can connect garage equipment and vehicles directly up to the MOT testing service - so results can be recorded directly without keying them in again. This may be able to help improve garage efficiency, customer service and fraud prevention - as well as better dealing with modern vehicles. Although this work is a while away from production, you might see the team out and about in garages, getting a better understanding of how we can make this work in different situations. Another large piece of work at the moment is the new roadworthiness directive that will come in May 2018. I’ll let you know more about this very soon, in another blog post - there isn’t room in this one! We’ll continue to keep you up to date with what we’re working on, and as always we’d appreciate your views on what we’ve covered so far. BRING BACK THE MOT TEST CENTRE LOCATION - ALSO AS VALUABLE AS SHOWING THE RECORDED MILEAGE. Bring back the name of the MOT testing station please. Please bring back the m.o.t test center location details. It was a great help. Please bring back the test station location field. It is useful to users and been a pain not having it of late. It also makes the app look broken when it isn't which is a shame given the hard work that's gone into making it. They call me up and ask me to confirm if the car has been tested at my station and would I have the service history and previous work on the car. Would I confirm the advisories etc... etc.. etc... It has been a NIGHTMARE to say the least! I am not your way to confirm if you are buying a dodgy car or not. Yes I have done the MOT and if I have put advisories then please take a note of this. I can't remember every day that I have tested. This has been a real headache and unnecessary stress! Lets face it they can get your details from the previous certificate, so it doesn't matter if it's on the system. I think it's good to have it on the system. Bill you can always get a 0845 number or a premium rate number and make some money instead of moaning. Transparency is a good thing. Hello, as a matter of interest, why has the test station information disappeared? This was of great use. We’re continuously reviewing our services and have temporarily taken this part of the service down to evaluate feedback. We welcome customers’ views and hope people will continue to let us know what they think. Hi Chris. Thank you for your reply. Let's hope it will be up again soon! i agree with Tom.c showing the testing station very useful and would love to see it back up. I also really hope this comes back. Why change something that works well, just for the sake of it? could you not include the previous mileage on vehicle information. this would at least give the tester a bit of a guide to what it was the previous MOT. I think extending the window to 28 days for the VTS to make the changes to mileages is a great idea too. I'm in agreement with this. I have had experience of trying to get the incorrect mileage altered outside of the period and it is a big problem under the current system. Extending the period for allowed for issuing a replacement certificate is an excellent idea. Its reassuring to know that someone in authority understands real world problems and takes action to develop a solution. Thank you for the update news. I agree that mileage changes should be able to be corrected at any time after the initial MOT during the following 12-13 months period. 1. Vehicles with the ability to change the car to read miles and kilometres, which make it appear that the car has been 'clocked' when reading the mileage history of vehicle. 2. The MOT tester has entered the computerised Job card number instead of the mileage. There is also the fact that I suffer from dyslexia, I'm 51 and have been like it since i started to speak, i can't always see an error when i swap a couple of digits over or read it wrong, it happens in my writing, spelling, speech and typing and has caused problems logging on/ entering start of test details too. I have been told I am a very competent mechanic & tester and have a clean MOT record for about 12 years of testing. Extending to 28 days would help very much. As for getting the equipment to talk to the mot system yes good idea BUT ONLY if you get it right. Seem to remember going down this road before paying manufacturers of gas analysers to check com ports. Only to find it was a waste of money our money. Certainly a longer duration of time would be good for correcting mileage errors, I have found often previous test certificates on grey import cars and bikes recorded in miles not KM. As we are about to request full authorisation on a new test centre opening shortly can I now expect the centralised service to deal with this request much more efficiently ? Weeks waiting for authorisation without being able to test could dramatically affect our business. As a class 1/2 tester I am always finding that outher testers have incorectly enterd a Miles recording instead of KM. On all UK imported bikes there is an outer and inner ring on the speedometer, one will be in MPH the outher will be in KPH. The outer ring is in bold type, if the outer ring is marked as KPH then the odometer will be read in KM and if the outer ring is marked MPH then the odometer will be read in Miles. Where the speedometer can be switched from MPH to KPH it always indicates which it is therfore inputing an incorect reeding is down to not taking the time to read the odometer correctly. Just print previous mileage on check sheet as well,when we record mileage it will look wrong? A lot of replacements are printed because the presenters loose their copy or just don't bother to look after it. Since the last change of the certificate to a black and white sheet of print very few seem to treat it with any care or interest. I think your confusing replacement with a duplicate, a replacement is issued if you need to make any alterations to mileage or colour, a duplicate is just that ,an exact copy of the original certificate for which you can charge for. I think its a very good idea to extend the time allowed to make amendments to the MOT certificate. I would like to see 28 days for the issuing station to amend any errors. In addition the certificate could be endorsed on the notes currently used under "About this document " to detail a disclaimer that no further changes are allowed after this time. I agree the grace time for changes could be extended to the full period of the certificate providing it’s the station concerned that makes the rectification and unequivocal proof of the error is provided.